Visualize your dream home and it can be yours. Whether it is down the street, in a different city, state, or country, PNV Home Group can help you find the perfect home. 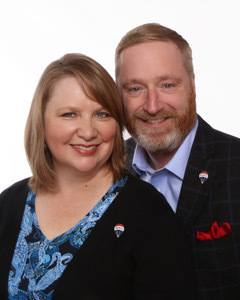 We are Michael and Regina Ferguson, aka, PNV Home Group. We started our real estate business with a desire to work together side-by-side using our individual skills and strengths for the benefit of others. We find tremendous satisfaction helping people understand that not only is homeownership possible, but also that it can be done with friendship, laughter, and a toast to your health - SLÁNTE, (that's an Irish toast. By the way, Michael can hold his own in a pub, speaking traditional Irish). If there is one more thing to know about us, we enjoy our Gaelic-Celtic ancestry. The PNV in our business name is short for "Potato and Veg." We found humor in the fact that every meal in Ireland is served with a potato and veg; so much that we took it to heart and gave our business that name.